“What is Nagayu Skin Care? “Nagayu is a compressed tablet consisting of carbon dioxide, hydrogen and bicarbonate. The system adds ions into the rinse following the shampoo, which has been an effective treatment on humans for years,” according to the manufacturer. This method originated in Nagayu, a small village located in southern Japan, where carbon dioxide occurs naturally in hot springs. The tablet is placed in a special shower head and is immediately dissolved with fresh, running water. When the body absorbs bicarbonate ions through the skin it causes the body to synthesize and release nitric oxide into the inner lining of the blood vessel. This process increases blood circulation and oxygen absorption. When oxygen is absorbed, bicarbonate ions and carbon dioxide within the body are excreted as by products. This process helps in the maintaining of the pH levels in the blood and skin. The CO2 treatment has the ability to remove mineral waste in clogged pores, which causes odor, while preserving the natural moisture levels in your dog’s skin. Dog’s skin is 1/3 the thickness of human skin. When the outer layer of skin is damaged it can cause an imbalance in the skin’s pH levels resulting in scabs, yeast, or oil build up. 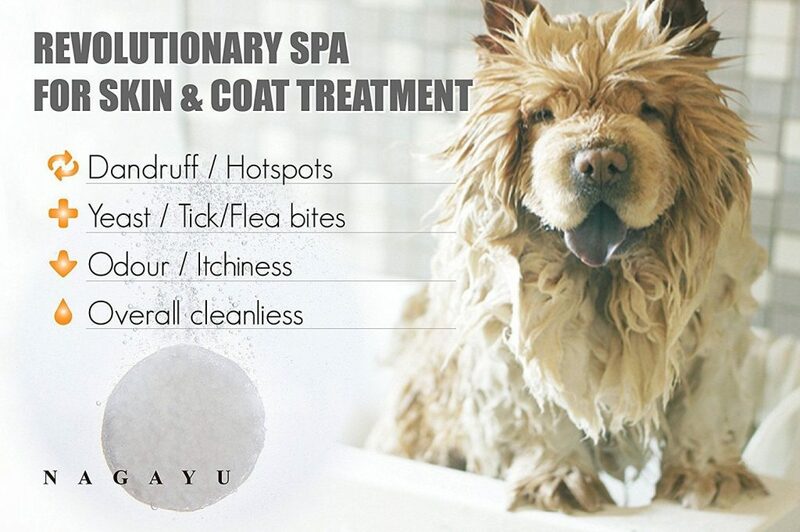 Using the CO2 treatment maintains the health and quality of your dog’s protective skin layers. The effect of the bicarbonate ions, hydrogen ions, and the citric acid wash off mineral and silicon dirt clogged in the root hair. This results in a full, silky and healthy coat.